Margaret Rivers newest campground. 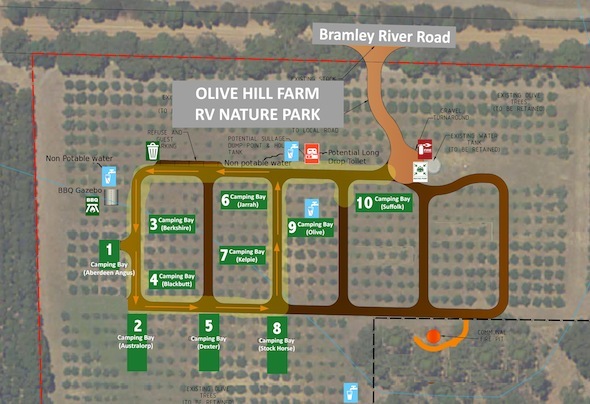 Olive Hill Farm is the 1st private campground on a farm under a new planning regulation of the Augusta Margaret River shire to encourage more people to stay in the region. Olive Hill Farms campground has only 10 caravan/ camping bays. Olive Hill Farm RV Campground is setup to cater for those who are self contained, in that they have their own toilet or porta potty. Families and Grey Haired Nomads have already started to catch on and are loving it. Sorry but the site is not suitable for backpackers in cars or vans and does not allow them. Olive Hill Farm are giving campers a chance to experience the peace and quiet of their location (only 10 minutes from Margaret River town), the enjoyment of space as all sites are within a mature olive grove of about 12 acres and a chance to walk around the farm. Yes facilities are ideal for those fully contained and the experience more than makes up for any short falls (no showers and no camp kitchen). On a desk top – Click here to visit the main website for Olive Hill Farm RV Campground in Margaret River OR.